Dieses moderne Design, gemütliches Haus liegt hoch oben in den Wäldern auf 10 Hektar abseits der Pikes Falls Road zwischen Stratton und Jamaika. Es ist eine großartige Lage - nur 3 Meilen von der süßen kleinen Stadt Jamaika und nur 4 Meilen von Stratton Sunbowl Zufahrtsstraße. Die Küche wurde komplett mit Granit-Arbeitsplatten, neuen Schränken usw. renoviert. In der Nähe von Skifahren, Wandern, Jamaica State Park, Einkaufsmöglichkeiten (z. B. ein großer Laden in Jamaika, viele Outlets in der Nähe von Manchester), gute Restaurants, oder einfach nur sitzen am Holzofen und genießen Sie die friedliche, abgeschiedene Umgebung mit einem gute Aussicht! Der Winterbonus ist das große Rodeln (Schlitten zur Verfügung gestellt!) und Wandern oder Schneeschuhwandern direkt vor der Tür! (Hinweis: Das Anwesen befindet sich auf einer schönen Landstraße, AWD oder 4WD ist im Winter normalerweise unerlässlich.) Es ist eine friedliche, wunderschöne Umgebung, um am Holzofen zu sitzen und den Schnee zu beobachten oder in wenigen Minuten auf der Piste zu sein. Im Sommer können Sie wandern, golfen, angeln, Kanu fahren und vieles mehr in der Nähe, darunter der nur 5 km entfernte Jamaica State Park. Ein wunderschönes, natürliches Bad und ein Wasserfall bei Pikes Falls sind nur wenige Kilometer entfernt. In der Nähe von Stratton Golf, Yoga und anderen Sommeraktivitäten. Wir machen keine saisonalen Wintermieten. Das kleine Haus verfügt über drei Schlafzimmer - 2 mit angrenzenden Bädern und ein zusätzliches Schlafzimmer mit 2 Etagenbetten. Der Schlafraum ist klein und ideal für Kinder, aber zu klein für 4 Erwachsene. Dieses Haus hat Charakter und die meisten Mieter wollen wiederkommen - probieren Sie unsere günstigen Preise und überzeugen Sie sich selbst! Perfect for a family or multiple families! We liked the two master bedrooms that each had their own bath. It was great once the wood stove kicked in and warmed the place up. It was a little chilly to start. But it didn’t take long. Great location if skiing Stratton. Overall a great weekend spot! Very cozy, warm, comfortable rental for a genuine VT experience! We really enjoyed our stay, and were overall very satisfied with Maggie’s house! Loved the quiet, up on top of a hill location-So peaceful and relaxing. You definitely need 4wd/awd in the winter! We didn’t get much snow, but some icy rain, and part of roads leading to house, up the hills are sloped, a bit steep and curvy, so having awd def helped! 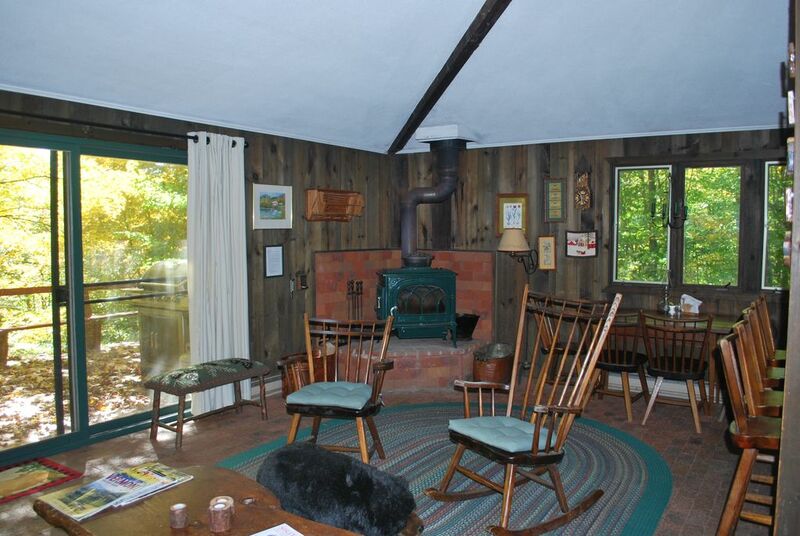 Loved the cabin feel of the house, and especially having an awesome wood stove to keep us warm. I grew up with one, and have also used one in a prior home of my own, so it was so nice to get to use one again. So nice to have a fire to watch, and keep us warm! We never used the electric heat, which did have some restrictions to save energy (peak and non-peak times of operation), so I would say, if going in the winter, you def need to be ok with using a wood stove for your primary heat source. We loved it! House was stocked with great dishes, pots and pans, cooking supplies, spices, etc. If you like to cook, great kitchen and pull up counter area. Comfy beds, and the couch is great for sleeping, too. We found the house perfect for us: simple, comfy and cozy, had everything we needed for a great week for skiing Stratton (up the back road about 10-15 min), exploring, and time with family and friends. Overall, great house, attentive and responsive owner, we enjoyed our stay and would rent again. We had a great stay at this welcoming and comfortable home. The property was nice and private and had everything we needed including a spacious deck overlooking the woods. There was more than enough room for the both of us and our dog. We had a wonderful relaxing vacation and will definitely choose this home for future Vermont vacations. We had a great family time in this house. A blast! Very close to the ski resorts, quiet and very cozy. If you are lucky you may even be able to enjoy the maple syrup the owners are doing. A little advice, in case of heavy snow the AWD is not only recommended, it is mandatory. Or be ready to walk half a mile. You can also train making fires prior to come in winter, but the instructions provided are very clear and everything is available for you to feel like at home. We stayed at this property for the MLK weekend with the intent to ski at Stratton. The house is between 5 and 10 minutes away from Stratton, depending on the lot you choose. The location is ideal to avoid the typical traffic experienced on the way to Stratton. While cozy, the house has charm and character, it is far from crowds, yet still relatively close to Jamaica to grab groceries or something to eat. Owners are very responsive, communicative, and friendly. We would stay there again. 4 Miles bis Stratton Sunbowl Access Rd. Final rates will be confirmed when booking is discussed and house info reviewed. Deposit amount to hold the reservation may vary.